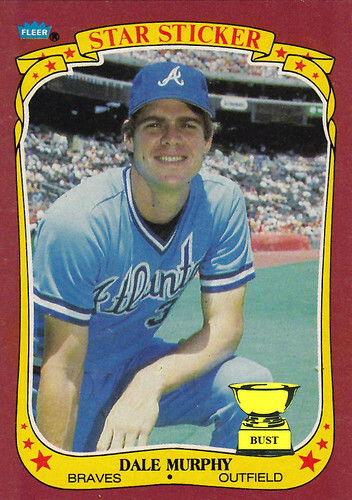 The price of beauty: For much of the 1980s, Dale Murphy was a stud, winning back-to-back MVP awards and leading the league in feces-eating grins. In 1985, Murphy led the NL in runs scored, home runs, walks AND strikeouts. What few people knew was that the majority of this talent was thanks to his conjoined twin, Dave Murphy, who was able to disguise himself as a mole on Dale's cheek. It was Dave's hawk-like vision and herculean strength that allowed Dale to rake in the praise and awards — and Dave made sure Dale knew about it, too. The evil twin mocked his brother's schoolmarmish arms, bowl haircut and lack of baseball talent so often, that in 1988, Dale elected to have surgery that would separate the pair. Dave, lacking organs and bones, died instantly, as did Dale's athleticism. He never hit over .270 again — though he did find more success with the ladies.